This research study on The Chicago Doctoral Student Cohort Group Advanced Supervision Course Case Study critically explored an understanding of the Department of Curriculum and Instruction’s Chicago Cohort Doctoral Student Group perceptions’ as it related to principles, strategies, skills, and dispositions used in the advanced application of a type of instructional supervision known as Clinical Supervision. Also, the study embraced the use of clinical supervision in Urban Schools related to Induction and Mentoring Programs for Teacher Evaluation, Growth and Development. The principles of a clinical-based method of instructional supervision were adapted to support the doctoral students’ applied field experience associated with the course in the conduct of using this type of supervision style with the teachers they interacted for their professional growth and professional development. Sixteen doctoral students enrolled in the Curriculum and Instruction (C&I) 577 Doctoral Level Graduate Course, Advanced Supervision, Fall Semester, 2006, participated in the research study. Survey questionnaires captured their perceptions at the start of the course as well as after the completion of the course. 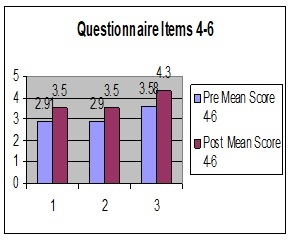 Without exception, there were increased mean scores over time for each survey item with several being significantly different at the p=.05 level. As well, significant qualitative differences in perceptions were found over time. The findings from the study suggest that the clinical supervision model had a significant impact on the cohort group from a formative teacher evaluation perspective designed to improve teachers’ professional growth, best practices, self evaluation and to improve student learning. In addition, we feel that the Clinical Supervision Model can be viewed as a core curricular component for the professional knowledge, skills, and dispositions as goals for Teacher Induction and Mentoring Programs as well as for Teacher and Administrator Education. One style of instructional supervision at the advanced level for teacher evaluation that promotes teacher growth is known as clinical supervision. Clinical supervision, according to Goldhammer (1969), suggests a “face-to-face relationship between teacher and supervisor and a focus on the teacher’s actual behavior in the classroom“. He stated, “Given close observation, detailed observational data, face-to-face interaction between the supervisor and teacher, and an intensity of focus that binds the two together in an intimate professional relationship, the meaning of ‘clinical’ is pretty well filled out.” Hence, a primary mission of clinical supervision is the professional development of teachers, with an emphasis on enhancing teacher’s classroom performance related to student learning. As well, a secondary benefit of using clinical supervision effectively is that it can also increase student achievement as suggested by Darling-Hammond (2003) where she pointed out that high-quality teaching provides a direct correlation to student success. Moreover, research has consistently demonstrated that capable teachers have the largest impact on student learning (Wilson, Floden, & Ferrni-Mundy, 2001; Laczko-Kerr & Berliner, 2003). The concept of clinical supervision was developed at Sanford University and Harvard University in the early 60’s, along with techniques for using videotape technology and other forms of feedback in the training of preservice and inservice teachers. Individuals in that project who influenced the ideas, research, and application of clinical supervision, microteaching and other new innovations in teacher education were Robert Bush, Dwight Allen, Fred McDonald, Norman Boyan, Horace Aubertine, Bill Johnson, Jim Olivero, Frank MacGraw, Al Robertson, and Jimmy Fortune (Acheson & Gall, 2003). Therefore, two major questions frame this research study. First, to what extent does the use of clinical supervision for instructional settings promote teacher growth associated with the induction and other phases of teacher development? Second, to what extent does training in clinical supervision advance the growth of mentors, for example, lead teachers, cooperating teachers, university field supervisors, principals, who use clinical supervision as part of their duties and responsibilities as instructional supervisors in P-16 settings? The first phase in the cycle is for the teacher and clinical supervisor to participate in a planning conference (also known as a pre-conference) in which the teacher identifies one or more areas of concern or desires for improvement in her/his teaching in which the supervisor helps translate those concerns into a plan for analyzing and improving in­struction. The main vehicle for this planning to be implemented during the pre-conference is to usually review the teacher’s most current version of a lesson (or set of lessons ) to be taught which the supervisor will be able to observe while the forthcoming lesson will be taught. During the pre-conference, the teacher verbalizes the intentions of the forthcoming lesson essentially by rehearsing what will take place in the classroom setting. The clinical supervi­sor may pose key clinically-based reflective questions related to what the teacher wants to occur during the lesson and may even ask the teacher to role-play possible student decision making processes, interactions and responses. Throughout the pre-conference, concerns about the lesson devel­opment or possible teaching and student learning strategies may be raised by either person. By the end of the pre-conference, the teacher and supervisor should mutually reach an agree­ment about which specific teaching behaviors and actions related to student learning outcomes, instructional tasks, learning activities, and so forth, will be focused on by the teacher and how the supervisor will collect observational data in these regards, intentionally or not throughout the forthcoming lesson. Phase two ideally occurs soon afterward in the cycle where the supervisor observes the teacher carrying out the lesson to her/his students recording as accurately as possible what transpires throughout the lesson. It is most beneficial, if possible, to videotape the lesson or at least audio-tape it so that actual teaching and student learning incidents may be reviewed later by the teacher and supervisor. The supervisor will generally also collect authentic data, take notes and record questions or reactions related to specific events that may not be readily captured on videotape. In order to have useful and authentic data available for the feedback conference (also known as the post-conference), Acheson and Gall (1992, 2003) recommend the use of several objective and valid data collecting methods. Some commonly used data re­cording methods include teacher rating scales, selective verbatim, salient behavior pattern analysis, targeted interaction and assessment analysis, observational records based on seating arrangements, and anecdotal records. In the final phase of the cycle, the teacher and supervisor participate in a clinically-based feedback conference (also known as a post-conference) after each of them hopefully have had an opportunity, if possible, to view the video­taped lesson and/or listen to the audiotape prior to the post-conference. Together, they clinically reflect on and discuss the data collected from the lesson observation. Instead of cri­tiquing the lesson from a summatively driven evaluation perspective, the clinical supervisor uses a formative evaluation perspective to encourage the teacher to make her/his own inferences about the effectiveness of her/his teaching in relationship to student learning. To facilitate teacher self analysis and reflection, if it is not forthcoming, the supervisor may pose focusing questions such as, for example, “What were your intentions at this point in the lesson? In what ways were your intentions realized throughout the various aspects of the lesson? What were the ways do you feel that the lesson was success­ful?” and may suggest viewing various segments of the vid­eotaped lesson together for verification of any percep­tions. Such close scrutiny allows the teacher to iden­tify, become conscious of, and analyze successful patterns to be reinforced in future lessons, or to work on changing unsuccessful patterns before they become a reoccurring problem in future lessons. The feedback conference (post-conference) may be viewed as a potential source of information for teacher development and planning as a teacher with supervisor assistance identifies areas that may need improvement or continued practice agreeing to col­lect further observational data from a formative evaluation perspective. To provide Teachers with Objective Feedback on the Current State of Their Instruction. To Diagnose and Solve Instructional Problems. To Help Teachers Develop Skills in Using Instructional Strategies. To Evaluate Teachers for Promotion, Tenure, or Other Decisions. To Help Teachers Develop a Positive Attitude about Continuous Professional Development (Acheson & Gall, 2003). We hypothesize that the principles of effective Induction and Mentoring align themselves positively with the principles of effective Clinical Supervision. In this context, any individual responsible for the professional development of teachers can incorporate the techniques for effective clinical supervision. Ross (1990) indicated that methods instructors, practicum supervisors, supervisors of student teaching, cooperating teachers, school administrators, curriculum specialists, and staff development specialists guide the professional development of teachers to varying degrees. We believe that all of these educators can make use of clinical supervision strategies and techniques (Acheson & Gall, 2003). …. The theory that actually governs [a professional] actions is his theory-in-use, which may or may not be compatible with his espoused theory; furthermore the individual may or may not be aware of the incompatibility of the two theories (Garman, 1986). This study was conducted to critically explore, understand, draw lessons from and gain a deeper understanding of the Chicago Doctoral Student Cohort Group’s perceptions as it relates to various subject matter content areas taught in an advanced supervision course related to advanced training as well as experience with a specific type of supervision model known as clinical supervision. The principles of a clinical-based method of supervision (Acheson and Gall, 1992, 2003) were adapted to support each doctoral student’s field experience, as an emerging effective clinical supervisor that occurred during the latter part of the course, in the conduct of using this type of supervision when interacting with a teacher for her/his professional growth. This is one of the key curricular components for the course. Sixteen doctoral students who were enrolled in C&I 577, Advanced Supervision, Fall Semester, 2006, voluntarily agreed to be involved in this research study. The physical school site for delivering this course was Eli Whitney Elementary School on the Westside of Chicago, IL. The researchers were known to the participants but were not seen as being intrusive. In no way was the participant’s involvement in this research study related to any aspect of them completing the doctoral course in advanced supervision. The researchers of this study did not look at any data collection and results of the completed surveys until final grades were posted for the course. Survey questionnaires captured their perceptions of instructional supervision at the start of the course as well as shortly after the completion of the course. Hence, two major questions framed this research study. First, to what extent does the use of clinical supervision for instructional settings promote teacher growth associated with the induction and other phases of teacher development? Second, to what extent does training in clinical supervision advance the growth of mentors, for example, lead teachers, cooperating teachers, university field supervisors, principals, who use clinical supervision as part of their duties and responsibilities as instructional supervisors in P-16 settings? Researchers have conducted studies of the effect of clinical supervision on various outcomes. For example, Jerich (1989), Using a Clinical Supervision Model for Micro-Teaching Experiences, found the extent to which the instructional supervisory style used by secondary education preservice teacher education clinical supervisors during microteaching lessons contributed to the preservice teachers’ understanding of various teacher-centered and student-centered teaching strategies. As a result in this setting, the use of clinical supervision was found to be quite effective and had a positive impact of the teacher growth of preservice teachers over time during their completion of a twelve week sustained teaching practice time period. The preservice teachers reported that they and their clinical supervisors work together to establish goals, consider alternatives, and establish mutually decided upon strategies for teacher growth. As well, Robinson (1998), Diversifying Supervision for Maximum Professional Growth: Is a Well-Supervised a Satisfied Teacher?, examined the relationship between various characteristics of the clinical supervision model and teacher job satisfaction. The first part of the paper described teacher job satisfaction and looked at the history and meaning of clinical supervision. The paper discussed four studies, two of which outlined work models of teacher empowerment and two which described successful models that included clinical supervision practices. The four studies described in the paper exemplified a movement to develop a supervision model that would improve teaching practice and indirectly improve teachers’ job satisfaction. This article suggested that if administrators can modify clinical supervision practices to increase teacher job satisfaction then more satisfied teachers would continue to improve their instructional practices. In turn, the result of such a system would provide an exemplary learning environment in which students could more easily achieve academic success. Furthermore, Hopkins (1995), Clinical Supervision: A Neo-progressive Approach, described how neoprogressive characteristics of clinical supervision possibilities can be incorporated into the supervision process to enhance teaching and learning through improvements of instruction within the classroom setting. The author described the characteristics and stages of the neoprogressive approach to clinical supervision, explaining why it offered potential for the school reform movement. As well, Thompson (1997), Integrating the Mentorship Factor into Clinical Supervision Model, argued that clinical supervision is an ongoing series of professional development cycles through which preservice and beginning teachers move from being apprentices at induction and probationary levels to being members of peer evaluation teams and self-reflective practitioners. These two supervisory cycles involved (1) a team teaching approach with peer clinical supervision and self-reflection; and (2) the supervisor taking the lead in individualized clinical situations. Hence, clinical supervision comes full circle when the teacher who has completed earlier cycles as a preservice teacher apprentice then becomes the master teacher which ultimately engages in reflective issues-centered teaching practice (Jerich, 1996). Moreover, Glickman and Bey concluded that clinical supervision has positive effects on teachers and students (Blumberg, 1980). Teacher’s ability to reflect on their instruction and engage in higher-order thinking. Collegiality, openness, and communications between teacher and between teachers, supervisors, and principal. Retention of teachers in the profession, while also reducing teacher anxiety and burnout. Teachers’ sense of autonomy, personal efficacy, and self-growth. Teachers’ attitude toward the supervisory process. Since the early 1990’s, the induction phase of teacher development has become an increasingly popular strategy for school districts across the country as they seek solutions for high attrition rate among new teachers who are new to the profession (Kapadia, Coca and Easton, 2007). The availability of formal induction programs and their structures vary among states and local school districts (Feiman-Nemser, 2001; Hargraeves, 1994; Moir, Strong, & Gless, 2003, Ingersoll & Kralik, 2003). For example, a 2007 study by the University of Chicago’s Consortium on Chicago School Research recently reported that many new Chicago Public School (CPS) teachers get no help as a professional teacher in an urban setting. More than one in four new Chicago Public School teachers reported that they didn’t complete any mandatory training program designed to bolster rookie teachers. In addition, only eight percent to 13 percent of novice CPS teachers reported getting the kind of intensive help from mentors and the school that seems to make a major difference in whether such rookies plan to stay in teaching and remain in their schools (Rossi, 2007). As well, in Illinois public schools the attrition rate among new teachers can be as high as 40 percent after only five years on the job (Illinois Educational Research Council, 2002). Numerous studies document the value of teacher induction programs which describe the benefits of the programs including not only reduced attrition rates among teachers but also improved teaching capabilities (Kortman, 2006). For example, mentoring from a teacher in the same field or grade coupled with common planning time and/or collaboration with colleagues on instructional issues appears to have a positive impact on retention rates (Ingersoll & Smith, 2004). When mentoring and induction systems are used in combination with other induction supports, for example, clinical supervision, it can be an even more effective means of improving beginning [and veteran] teachers’ experiences and prospects for remaining in the profession. This study consisted of sixteen doctoral students enrolled in an advanced supervision course during the 2006 Fall semester. Since volunteers were relied on to participate in the study the sample is not representative of all Chicago Public School teachers. Hence, the size of the sample was also a limitation for the study. Furthermore, the small size of the sample may be seen as precluding a sense of generalizability of the results beyond this setting (Babad, Bernieri & Rosenthal, 1987, Kunes, 1991). provision of detailed description so that everyone interested in transferability will have a solid framework for comparison (Merriam 1988). Three techniques to ensure reliability were employed in this study. First, the researchers provided a detailed account for the focus of the study and the participant’s position and the basis for their selection and the context from which data will be gathered (LeCompte & Goetz, 1984). Second, triangulation of the data collection and analysis was used to strengthened reliability as well as internal validity (Merriam, 1988). Finally, data collection and analysis strategies were reported in detail in order to provide a clear and accurate picture of the methods used in this study. This study used quantitative and qualitative analyses to examine the perceptions of the participants. 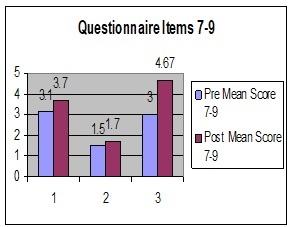 A survey consisting of 20 structured questions and one open-ended question was administered to critically explore, understand, draw lessons from and gain a deeper understanding of the Chicago Cohort Doctoral Student Group perceptions’ as it relates to principles, strategies, skills, and dispositions used in the advanced application of a type of instructional supervision known as Clinical Supervision. Participants signed a consent form volunteering to participate. Anonymity was guaranteed for all participants as both the pre and post survey forms contained no identifying information that would reveal the identity of the participants in this study. A descriptive research design and appropriate research pedagogical methods were used to analyze the participant’s responses to the survey items for the study. Likert scaled questions were constructed to collect specific information regarding the participant’s perceptions of factors related to clinical supervision. Volgt, 2006, reported that scaled questions are considered to be more accurate than other questions formats. In the quantitative portion of the research study, Likert scale responses: (1= not at all; 2=to some extent; 3=moderately so; 4= reasonably so; 5=very much so) were used to analyze the data using the Statistical Package for Social Science. An item reliability measure known as Cronbach’s alpha yielded a .762 level of confidence in the instrument. The descriptive analysis used measures of central tendency and t-test methodology to analyze the results of various survey questions. Using the qualitative content analysis research method, the participant’s responses to survey questions 16-20 revealed themes determined to be related to the areas of professional development, best practices and self reflection. Without exception, the Chicago Doctoral Student Cohort Group specifically indicated that the completion of the advanced supervision course which centered on the concept of clinical supervision contributed to their overall growth as instructional supervisors, mentors and teachers (see Table One). Quantitative findings. Question one, that is, “Do you possess the knowledge, skill, and disposition to be an effective instructional supervisor?” asked the doctoral students to judge their level of expertise as an effective instructional supervisor based upon their previous training and experiences prior to taking the advanced supervision course. It is to be noted that two members of the cohort group were principals in their buildings and nine were lead teachers in the buildings providing feedback to beginning and other teachers at their school sites; while the remaining doctoral students were classroom teachers aspiring to become lead teachers in their school buildings. * indicates a significant difference at the p=.05 level. Their first judgment as a group at the beginning of the course yielded a mean score of 3.41 on a five point scale, (1=low and 5=high), that is, their expertise at that time was at the “mid-moderate” to a “reasonable so” level of experience as an effective instructional supervisor. Shortly after completing the course, they reported a mean score of 4.22, indicating that their level of expertise dramatically increased to the level of “reasonable so” to “very much so” which is a significant increased at the p=.05. Question two, that is, “A goal for instructional supervision is to improve teacher moral and job satisfaction?” produced a similar result to that one question one with a pre-test mean of 2.42 to that of a post-test mean score of 4.10 (p>.009). Their overall view on instructional supervision based upon the infusion of the clinical supervision model for instructional settings taught in the course resulted in a positive gain in belief that teacher moral and job satisfaction for teachers can be positively influenced by the ways in which supervisory practice is used in a school setting. Question three, that is, “Instructional supervision should be used to summatively evaluate the instructional competence of a teacher?” was seen as being an element in the overall scheme of evaluating the effectiveness of a teacher. Question four, that is, “To what extent is it possible to eliminate any power differential present between the instructional supervisor and teacher?” was viewed in a positive way by the doctoral student cohort group. From the Likert scale points, that is, an indication of “moderately so” to the “mid-reasonably so” level indicated a positive shift, that is, that the use of clinical supervision should be used when a supervisor interacts with a teacher during the evaluation process for instructional settings. Question five, that is, “Do you think clinical supervision should be used to evaluate a teacher’s instructional competence?” resulted in the doctoral cohort group indicating that clinical supervision should be used, for example, from “moderately so” to “mid-reasonably so” when evaluating a teacher’s overall performance. Question six, that is, “The central focus of instructional supervision is to formatively evaluate the instructional effectiveness of a teacher?” was seen as being an important element in the overall scheme of evaluating the effectiveness of a teacher. Question seven, that is, “To what extent do you believe that an instructional supervisor should be the change agent of a teacher’s instructional effectiveness in the classroom?” indicated that the cohort group strongly believes that the instructional supervisor using clinical supervision should be an integral part of teacher growth over time. Question eight, that is, “Do you believe that an instructional supervisor should maintain a hierarchical position of power when evaluating the effectiveness of the teacher in the classroom?” yielded a slight increase in perception from a pre-test mean of 1.50 to a post-test mean of 1.75. Question nine, that is, “Do you think that the direct observation of a teacher by an instructional supervisor in the classroom setting contributes to the professional growth of the teacher?” shows a dramatic positive change (pre-test mean of 3.0 to a post-test mean of 4.7 (p>.006 significance level) in the way the doctoral cohort group views the power of using clinical supervision to contribute to the professional growth of a teacher. Question ten, that is, “To what extent do you believe teachers benefit from having an instructional supervisor observe their teaching practice in the classroom setting as part of their professional growth in the teaching profession?” also shows a dramatic positive change (pre-test mean of 3.75 to a post-test mean of 4.7 (p>.009 significance level) in the way the doctoral cohort group views the power of using clinical supervision to contribute to the professional growth of a teacher. 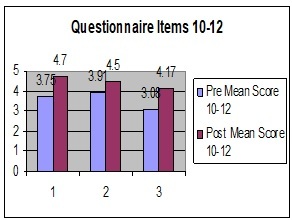 Question eleven, that is, “A key purpose of instructional supervision is to provide feedback regarding acceptable standards of teaching performance in the classroom setting?” is viewed by the doctoral cohort group as being a key purpose of instructional supervision (pre-test score of 3.91 and a post-test score of 4.5). 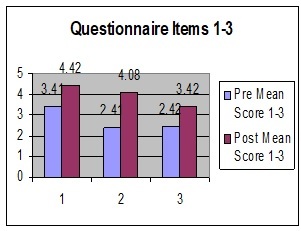 Question twelve, that is, “A major purpose of instructional supervision is to provide high quality feedback to the teacher on a frequent basis?” shows a significant change (pre-test score of 3.08 and post-test score of 4.17; p>.05 significance level) in the way the doctoral group views the importance of using clinical supervision as an integral part of instructional supervision to provide high quality feedback to a teacher on a frequent basis. 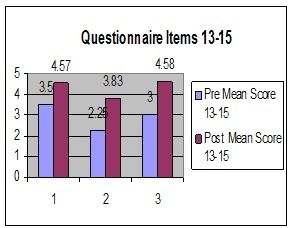 Question thirteen, that is, “Do you believe that the use of instructional supervision contributes to a teacher’s success when dealing with student learning outcomes in the classroom setting?” also shows a significant change (pre-test score of 3.5 and post-test score of 4.67; p>.004 significance level) in the way the doctoral group views the importance of using clinical supervision as an integral part of instructional supervision to provide high quality feedback to a teacher when dealing with student learning outcomes in the classroom. Question fourteen, that is, “Do you believe that an instructional supervisor should facilitate professional growth while evaluating a teacher’s performance in the classroom setting?” yielded a dramatic positive change in perceptions of the doctoral student group from a pre-test mean of 2.25 indicating “to some extent” to a significant increase at the p>.014 level for the post-test mean of 3.83 indicating “reasonably so” based upon the outcomes of the doctoral level course in advanced supervision. Finally, question fifteen, that is, “To what extent should clinical supervision be used in instructional settings?” indicated that the doctoral group views (pre-test mean of 3.0 to a post-test mean of 4.58; p>.005) the use of clinical supervision for instructional settings to be a very positive model for promoting teacher growth over time. Qualitative findings. To advance the doctoral student’s interpretative thoughts and perceptions qualitatively, we constructed six open ended survey questions (see tables two and three). Table Two represents survey items 16-20. Coding was used as a part of the process of analysis and allowed the researchers a way to simplify and reduce the data. The coding system assisted the researchers in identifying meaningful data and set the stage for interpretation and drawing conclusions (Strauss & Corbin, 1990). The findings from the last opened question of the survey instrument are in Table Three. Table Two: Survey Items 16-20. Subjects’ impressions, opinions, and/or beliefs. *multiple responses of similar kind are categorized into theses, for example, best practices. hoped, will better deliver mentoring and other support systems for teachers. Hence, these types of comprehensive and systematic efforts will enable the current and future generations of teachers to have good professional experiences, continue in the profession and hopefully stay in the same school as a teacher. Table Three: Subjects’ impressions, opinions, and/or beliefs. supervisors. As well, the doctoral students have shared their perceptions about the use of clinical supervision contributing to the knowledge, skills and dispositions necessary to have as administrators and lead teachers who routinely work with other teachers in their schools. The participants in this study firmly believe that by using various effective clinical supervision strategies teachers are then provided with constructive feedback as an effective style of formative assessment and teacher evaluation. When considering the two major questions that framed this research study, it was interesting to discover, for example, (a) that a consistent pattern emerged as to extent to which the use of clinical supervision for instructional settings promoted teacher growth associated with the induction and other phases of teacher development, and (b) the ways in which their training in clinical supervision throughout the course advanced their growth as teachers and mentors, for example, lead teachers, cooperating teachers, university field supervisors, principals, when implementing the use of clinical supervision as part of their duties and responsibilities as instructional supervisors in P-16 school settings. Based upon completing the doctoral level graduate course, C&I 577, Advanced Supervision, the Chicago Doctoral Student Cohort Group shared various highlights about their own professional growth as emerging clinical supervisors that included, but were not limited to, the following principles: First, they have a highly increased awareness of the complexities of working with teachers to foster improved teacher moral and job satisfaction. Second, they realized the vast importance of eliminating any power differential between any instructional supervisor (and/or mentor) and teacher as the use of effective clinical supervision plays an integral role in this aspect of teacher empowerment, growth and development. Third, they indicated the importance of using effective clinical supervision as a means to provide substantiated data and analyses for constructive and highly valued feedback to a teacher. Fourth, they now believe even more strongly than before that a teacher’s success when dealing with student learning and their outcomes can be strengthened by using effective clinical supervision as part of a formative assessment and teacher evaluation system. Fifth, their beliefs shifted from thinking that effective teacher evaluation is grounded by the summative evaluation principles still used by many instructional supervisors in schools to that of thinking that the improvement of teaching practices of teachers should be grounded by using principles of formative evaluation. Sixth, their beliefs also shifted from thinking that teacher growth does not only center on effective classroom management techniques to that of a broader perspective that teacher growth should be theoretically grounded in the principles of reflection, self-assessment and ongoing professional growth as a teacher. Seventh, they see the use of effective clinical supervision in the context of teacher evaluation as providing professional growth opportunities for teachers to realistically look at their teaching practices while at the same time assessing their student’s learning and their outcomes linked to learning standards. Eighth, they echoed the need for and dramatic increased use of an effective clinical supervision model as an excellent basis for professional development in various stages of a teacher’s professional development, for example, the induction years as well as far beyond the first five years of a teacher’s career, in a systematic way with novice, veteran and struggling teachers. Given the findings of this research study we believe that the clinical supervision model can be seen as a phenomenon designed to (a) improve classroom teachers’ performance by collecting objective data from the classroom, and (b) analyzing the data and developing new strategies to enhance a teacher’s professional development in connection with their students’ achievement. As well, and more importantly, effective pre and post-conference consultation are integral components of the overall clinical supervision process. Furthermore, we believe that school based mentors should be fully trained in the clinical supervision model who work with beginning teachers during the induction years of the professional development as teachers. Ingersoll and Kralik (2004) substantiated the promise in the use of induction and mentoring as a means of reducing high teacher turnover. We see that both phenomena as being beneficial in three areas: 1) higher teacher retention; 2) effective teaching practice; and 3) meaningful and significant student achievement. Moreover, we are proposing that the effective use of the effective clinical supervision model that the Chicago doctoral student cohort group learned and experienced by completing the advanced supervision course and the applied field experience associated with the course become a foundational and core component for the professional knowledge, skills and dispositions as goals for Teacher Induction and Mentoring Programs as well as for Teacher and Administrator Education Programs. Acheson, K, and Gall, M. (1992). Techniques in the Clinical Supervision of Teachers: Preservice And Inservice Application (3rd ed.). New York: Longman. Acheson, K, and Gall, M. (2003). Clinical Supervision and Teacher Development, Preservice and Inservice Applications (5th ed.). New York: John Wiley & Sons, Inc.
Babad, E., Bernieri, F., and Rosenthal, R. (1987). Nonverbal and verbal behavior of preschool, remedial, and elementary teachers. American Education Research Journal, 24, 05-416. Bell, Judith. (2005). Doing your Research Project. Berkshire, England: Open University Press. Darling-Hammond, L. (1989). Accountability for professional practice. Teacher College Record, 91(1), 59-80. Darling-Hammond, L. (1994). Developing professional development schools: Early Lessons Challenges and promise. In L/ Darling-Hammonds (Ed. ), Professional development schools: Schools for developing a profession (pp1-27). New York: Teachers College Press, p. 4. Dropkin, S. & Taylor, M. (1963). Perceived problems of beginning teachers and related factors. Journal of Teacher Education, 14, 384-389. Feiman-Nemser, S. (2001). From preparation to practice: Designing a continuum to strengthen and sustain teaching, Teachers College Record, 103(6), 1013-1055. Garman, N.B. (1986). Reflection, the heart of clinical supervision: A modern rationale for practice. Journal of Curriculum and Supervision, 2, 1-24. Goldhammer, R. (1969). Clinical Supervision: Special Methods for the supervision of Teachers. New York: Rinehart & Winston. Griffin, G.A. (1986). Preface. In Griffin, G.A. & Milies, A.S. (Eds. ), The first years Teaching: Background papers and a proposal. Chicago: University of Illinois At Chicago. Hargreaves, A. (1994). Changing teachers, changing times: Teacher’s work and culture in the postmodern age. New York: Teacher College Press. Hopkins, W.S., & Moore, K.D. (1995). Clinical Supervision: A Neo-progressive Approach. Teacher Educator 30(3), 31-43. Ingersoll, R., & Kralik, J. (2003). A review of empirical research on the effects of teacher mentoring programs in elementary and secondary schools, Denver: The Education Commission of the States. Ingersoll, Richard M. (2004). Why do high poverty schools have difficulty staffing their classrooms with qualified teachers? Paper prepared for the conference “Renewing our schools, securing our future: A National Task Force on Public education.” Washington, D.C.: Center for American Progress/ Institute for America’s Future. Ingersoll, Richard M. and Jeffery M. Kralik. (2004). The impact of mentoring on teacher retention: What the research says. Denver, Colorado: Education Commission of the States. Ingersoll, Richard M. and Smith, T. (2004). What are the effects of induction and mentoring on beginning teacher turnover? American Educational Research Journal, 41(3),681-714. Jerich, K, F. (1989). “Evaluating the Use of Clinical Supervision during pre-and post- Conferences Associated Microteaching Practice in Teacher Education.” Action in Teacher Education, 11 no. 4, 24-32. Jerich, K. (1996, November). Supervision for teacher growth in reflective, issues-centered teaching practice. In R. W. Evans & D. W. Saxe (Eds. ), Handbook on Issues-Centered Education. pps. 306-315. Washington, DC: The National Council For The Social Studies. Kapadia, K., Coca, V. and Easton, John Q. (2007). Keeping New Teachers: A First look at the influences of Induction in Chicago Public Schools. Chicago: Consortium on Chicago Research at the University of Chicago. Kortman, S. A. (2006). BEST program supports and retain quality educators. One Planet, 1(2), 80-81. Kunes, M.V. (1991). How the workplace affects self-esteem of the psychiatric nurse. Unpublished dissertation proposal. University of Nebraska, Lincoln. Laczko-Kerr & Berliner, D.C. (2003). In harm’s way: How under certified teachers hurt their students. Educational Leadership, 60(8), 34-39. Association for Supervision and Curriculum Development. Ladson-Billing, Gloria. (1994). The dream keeper: Successful teachers of African American children. San Francisco: Jossey-Bass. LeCompte, M.D. & Goetz, J.P.(1984). Problems of reliability and validity in research. Review of Educational Research, 52, 31-60. McDonald, F. (1980). The problems of beginning teachers: A crisis in training. Vol 1. Study of induction programs for beginning teachers. Berkeley, CA: Educational Testing Service. ETS Document Reproduction Contract No.-349 97-9097. McDonald, F.J. & Elias, P. (1982). The transition into teaching: The problem of Beginning teachers and programs to solve them. Summary Report. Berkeley, CA: Educational Testing Service. ETS Document Reproduction Contract No.- 400-78-0069. California/Santa Cruz. Teachers for a New Era Induction Forum at AED (Academy for Educational Development June 16-17, 2003. Moran, S.W. (1990). Schools and the beginning teacher. Phi Delta Kappan, 72(3), 210-213. National Board for Professional Teaching Standards. (1990). Toward high and Rigorous standards for the teaching profession. Detroit, MI: National Board for Professional Teaching standards. Robinson, S.G. (1998). Diversifying Supervision for Maximum Professional Growth Is a well-supervised teacher a satisfied teacher? paper. ED429038. Ross, D.D.(1990). Programmatic structures for the preparation of reflective teachers. In Clift, R.T.
Houston, W.R. & Pugach, M.C. (Eds. ), Encouraging reflective practice in education: An Analysis of issues and programs (pp. 57-110), New York: Teacher College Press. Rossi, Rosalinda, “Many new CPS teacher get no help, study finds,” Chicago Sun-Times, 26 January 2007, p. 20. Schon, D.A. (1987). Educating the reflective practitioner: San Francisco: Jossey-Bass. Schon, D.A. (2000). The Reflective practitioner: How professionals think in action. New York: Basic Books; Argyris, C. & Schon, D.A. (1974). Theory in practice: Increasing professional Effectiveness. San Francisco: Jossey-Bass. Smith, H.P. (1950). A study of the problem of beginning teachers. Educational Administration and Supervision, 36, 257-264. Strauss, A. L. & Corbin, J. M. (1990). Basic of qualitative research: grounded theory procedures and techniques. Newbury, CA. : Sage Publications. Thompson, J.R. (1997). Integrating the Mentorship Factor into the Clinical Supervision Model. paper, ED411235. Vogt, W.P.(2006). Qualitative research methods for professionals in Education and other fields. Boston, MA: Allyn & Bacon. Wilson, S., Floden, R., & Ferrini-Mundy, J. (2001). Teacher preparation research: Current knowledge, gaps, and recommendations. Seattle, WA: Center for the Study of Teaching and Policy, University of Washington. Zeichner, K. M., & Liston, D. P. (1987). Teaching student teachers to reflect. Harvard Educational Review, 57, 23-48. Mr. Tonee Buwana is a doctoral student in residence completing his Doctor of Education in Education degree in the Department of Curriculum and Instruction. Mr. Buwana is a former Chicago Public School student and teacher. He has academic expertise and experiences in African American and African History and International Curriculum Policy Analysis/Teacher Education in South Africa. Dr. Ken Jerich is Professor of Teacher Education in the Department of Curriculum and Instruction. His academic expertise and experiences include the areas of P-20 teacher education, instructional and clinical supervision, music education, teacher evaluation and program evaluation. Please circle one answer for each quantitative item 1-16 below. Then go on to complete the rest of the survey items. 16. What do you consider to be the benefits, if any, for using instructional supervision to evaluate a teacher’s instructional practices in the classroom setting? 17. What do you consider to be the three most important characteristics for teacher growth, if any, when instructional supervision is used to evaluate a teacher’s instructional practices? 18. What were the benefits for your professional growth, if any, when you were evaluated by an instructional supervisor (e.g., principal, lead teacher, department head) in your classroom? 19. What do you believe were the three most negative aspects, if any, regarding the ways in which you were evaluated in the classroom by an instructional supervisor? 20. What do you believe were the three most positive aspects, if any, regarding the ways in which you are evaluated in the classroom by an instructional supervisor? If you wish, what other comments and/or remarks would you like to make below regarding the roles and responsibilities of an instructional supervisor in the context of teacher evaluation in the classroom setting and professional growth of a teacher?